Nonalcoholic steatohepatitis (NASH) is the most frequent cause of liver dysfunction and a common global problem. Gypenosides can decrease pathological modifications of high-fat diet-induced rat atherosclerosis; however, its effect and mechanism on NASH remain unclear. In this study, rats were randomly divided into normal control and model groups. Model rats were fed with a high-fat diet and treated with gypenosides, rosiglitazone, or water for 6 weeks. We found that liver tissues showed significant hepatic steatosis and vacuolar degeneration with significantly higher triglyceride (TG), free fatty acid (FFA) and malonyl CoA, serum alanine aminotransferase (ALT), aspartate aminotransferase (AST) and gamma-glutamyl transferase (GGT) activities in model group versus normal control group (p<0.01). 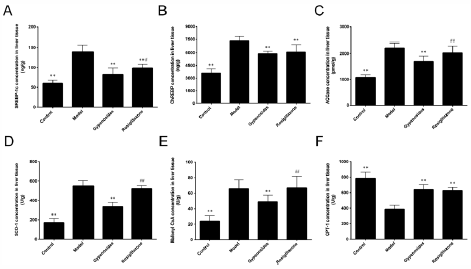 Liver tissue mRNA and protein levels of sterol regulatory element binding protein-1c (SREBP-1c), carbohydrate response element binding protein (ChREBP), acetyl-CoA carboxylase (ACCase), and stearoyl CoA desaturase enzyme 1 (SCD1) were significantly increased, while the carnitine palmitoyl transferase-1 (CPT-1) level was significantly decreased in the model group versus the normal control group (p<0.01). Pathological changes of hepatic steatosis; body weight and liver wet weight; liver tissue TG, FFA and malonyl CoA concentrations; serum ALT, AST and GGT activities; liver tissue mRNA and protein levels of SREBP-1c, ChREBP, ACCase, and SCD-1 were significantly decreased; protein and mRNA levels of CPT-1 were significantly increased in the gypenosides group versus model group (p<0.01). In conclusion, gypenosides has therapeutic effect on NASH through regulating key transcriptional factors and lipogenic enzymes involved in fatty acid oxidation during hepatic lipogenesis.